In the universe of unfairness, hovering right there near the top of the list is the fact that potato salad isn’t low in calories. That injustice is right up there with the fact that I am only 5 feet, 2 inches, thereby being six inches too short for my weight; that Chip and Joanna Gaines aren’t going to do a total remodel of my house including, but not limited to, knocking down walls and installing a kitchen island and shiplap; that I don’t own a private jet that would take me on weekend excursions to Paris or Hawaii or to visit my grandchildren; or that I have 128 gigabytes of memory on my iPad Air, and not only will I never use that many gigabytes of memory, I don’t even know what a gigabyte is. But potato salad. That’s the one that really hurts. I mentioned yesterday that Bec made her delicious potato salad for Sunday’s Super Bowl party. It’s true that I had a spoonful of the potato salad with my burger. But anyone who has entertained a group of people – particularly if you’ve entertained a group of people after drinking two Bloody Mary’s – knows that you don’t really taste what you’re eating when you’re trying to figure out at the same time if there are enough brownies to feed everyone, and deciding to rely on the Jesus-And-The-Loaves-And-Fishes miracle. That worked, by the way. The 9×9 pan of brownies not only fed everyone who wanted one, but there were 12 baskets to spare. Well, actually, three small brownies. Bec, by the way, also made the brownies. I really didn’t do anything except call it my party. Yesterday at lunchtime, I scooped me up a spoonful of the potato salad that I had dutifully packaged up for Bec to take home but forgot to send with her (I’m blaming the Bloody Marys, though by the time she left, all that was left of the Bloodys was a bit of tomato juice in the corner of my mouth and the smell of the celery and bacon on my breath). My first bite confirmed what I already suspected: the potato salad was sublime. Because as good as potato salad is the first day, the second day is even better. So one scoop soon became two, and with it came the sad realization that I wasn’t going to lose weight by eating the entire remaining potato salad, even inasmuch as I would certainly have been ABLE to eat the whole bowl. You’ve heard of the grapefruit diet and the leek soup diet and the vinegar diet. You’ve never heard of the potato salad diet. BECAUSE IT DOESN’T EXIST, even in the minds of the most creative weight loss diet book authors. Many years ago, I came across a recipe in a Bon Appetit magazine. I know. Like I actually ever read Bon Appetit. I must have been in the fancy waiting room of the place where I get my mammogram. But, whatever. The recipe was for Roseanne Cash’s Potato Salad. Normally, I don’t think a potato salad recipe would catch my attention, as I think on the rare occasions that I ever made potato salad, I would have used my mother’s recipe. Mostly I think I let someone else bring the potato salad. But this one caught my eye because it contained diced-up dill pickles. Though this might not be an exceptionally rare ingredient for potato salad, in my world, it was. Because Mom’s potato salad had no pickles, dill or otherwise. So I tore out the recipe, creating a big hole in the page where the next reader was about to learn the secret ingredient in Emeril Lagasse’s Banana Cream Pie. Sometime (literally, several years) later, Bec was visiting us in Denver and had occasion to make potato salad. “I have a really good recipe,” she said. “Oh, I have a better recipe than yours,” I challenged her. “Nope, I’m sure mine is better,” she stated firmly, probably making a mental note to bring up my obstinance during the airing of grievances at our next Festivus celebration. “Mine is from Roseanne Cash!” I said with great jubilation. Further proof, don’t you know, that great minds think alike. 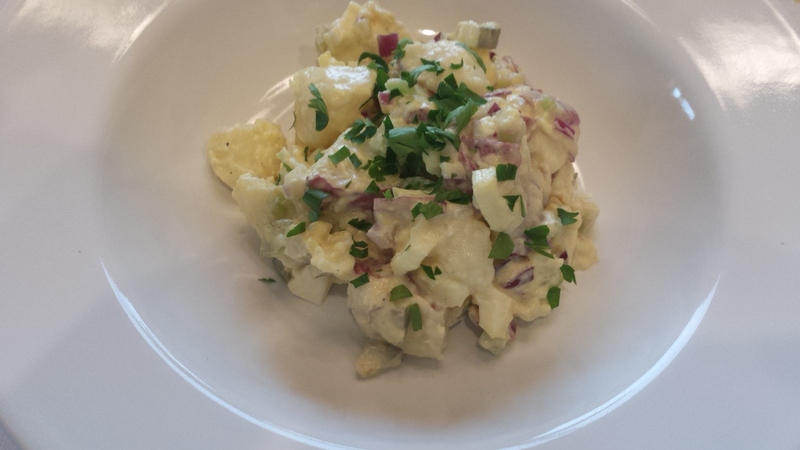 And just so that I don’t leave you all hanging, here is the recipe for potato salad…. Cook potatoes in large pot of boiling salted water until tender, about 20 minutes. Drain well and cool. Transfer potatoes to large bowl. Stir in dill pickles, celery, onion, eggs, mayo, and mustard. Season with salt and pepper. Can (and frankly, SHOULD) be made a day ahead. Cover and refrigerate. Let stand at room temperature one hour before serving. May I refer you to paragraph 5 and the line, “I’m blaming the bloody Mary’s?” Have I taught you nothing? Everything that goes wrong in the universe is the Patriot’s fault! And I add a little pickle juice to the mayo and mustard dressing, because that’s what our mom did for her potato salad. Changin’ it up. I won’t tell our BFF Roseanne.